QuickBooks 2013 makes it easy for accountants to record journal entries. If you’ve spent any time working with QuickBooks, you may know that most of the journal entries that get recorded into the QuickBooks data file are recorded automatically. If somebody writes a check, for example, QuickBooks records the journal entry for that. When somebody creates an invoice, again, QuickBooks records the journal entry for that. In some cases, however, somebody — probably you — needs to record a journal entry to get some transaction into the QuickBooks data file. For example, you use journal entries to record depreciation, to accrue liabilities, and to record the disposal of assets. To record a journal entry, choose Company→Make Journal Entries. 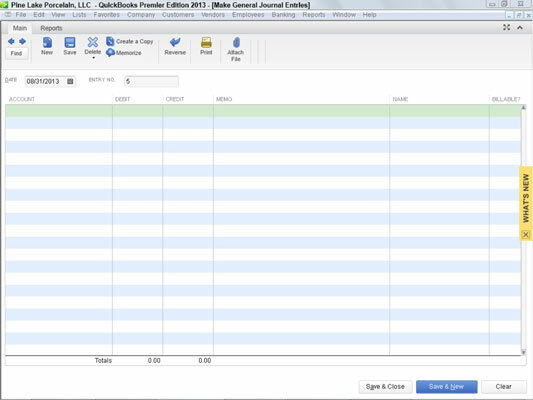 QuickBooks displays the Make General Journal Entries window. You can probably figure out how to use the Make General Journal Entries window yourself. You enter the general journal entry date into the Date box. You use the Entry No. box to number journal entries or to assign them some meaningful code. After you provide this basic information, you use the columns of the Make General Journal Entries window to record the journal entry. You don’t need me to tell you that the general ledger account number or name goes into the Account column, the debit amount into the Debit column, and the credit amount into the Credit column. You may find it useful, though, to be reminded that you can use the Memo column to enter some description of the debit or credit; you can use the Billable column to indicate that the debit or credit should be listed as an amount to be billed to the named customer; and you can use the Class column to classify the debit or credit.